A sleek American-made steel laying tool that is a pleasure to use. It has a very sharp point that is also useful for widening canvas holes where necessary. Also available: Hand-Turned Wood "BLT" Case by Nino. 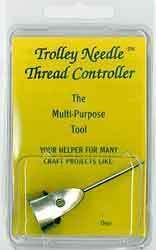 This tool is adjustable and is designed to fit around the index finger or thumb, becoming an extension of the hand. 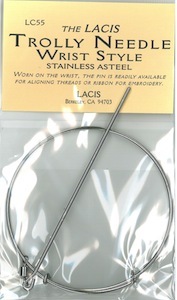 This handy device has a 4 1/2" stainless steel laying tool similar in diameter to a weavers needle. It is linked to an adjustable stainless steel bracelet that fits comfortably around the wrist. This laying tool does not taper to a point. When not in use the laying tool hangs freely off the ring. No more searching under couch cushions to find your laying tools!